wellness and vitality starting now. If you are a new patient, please complete your new patient registration online at least one full business day in advance of your first appointment with us. We value your time and therefore make every effort to be on-time ourselves and request that you do the same. Please bring your insurance card to each visit. It is helpful if you know your office visit co-pay and so that we may courtesy bill your insurance. Please bring payment in the form of cash, check or credit card (Mastercard, VISA or Discover). Curb your wheels when parking to avoid getting a ticket. The office is on the west side of the street slightly more than 1 block south of Honolulu. There is 2-hour free parking on both sides of the street directly in front of the office. As you should not have to wait long for your appointment, this should be plenty of time. However, if you are here for an extended IV drip, then parking in one of the free 3-hour parking lots a block away is a good idea. 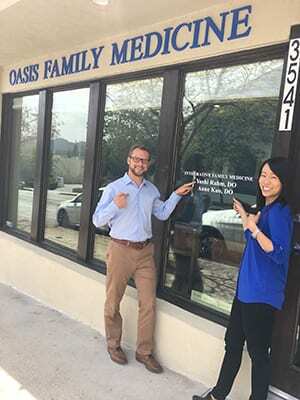 © 2019 Oasis Family Medicine, Inc.